Breakstone, White & Gluck was pleased to support MassBike’s Light Brigade 2018, which delivered bike lights to cyclists who needed a set so they can be visible to drivers. 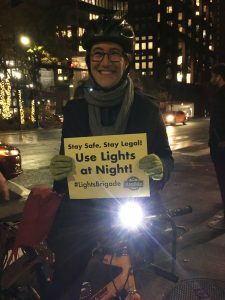 All Photos: Courtesy of MassBike Light Brigade 2018 Facebook Photo Album. 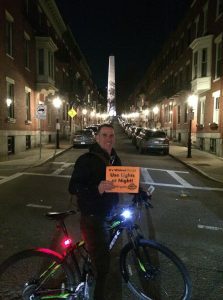 We want to say job well done to MassBike for helping cyclists ride safely at night in Massachusetts. 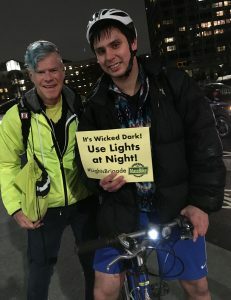 Over the past few weeks, MassBike has been distributing bike lights to cyclists from near and far, shining a light on the importance of staying visible during these dark days of winter. Under Massachusetts law, cyclists are required to use bike lights from 30 minutes after sunset until 30 minutes before sunrise. The front of the bike must be equipped with a white light (visible at least 500 feet away), with a red light or reflector on the back. Drivers must be able to see the rear light from at least 600 feet away. MassBike is committed to getting lights to cyclists, reaching across 90 miles with this year’s campaign. Volunteers have given out lights in Boston, including in the Allston, Jamaica Plain and Charlestown neighborhoods and nearby: Cambridge, Lynn, Newton and Needham. Further west, cyclists in Northampton, Holyoke and Worcester also received lights. We’re told there may be more stops. Breakstone, White & Gluck was a sponsor of MassBike’s campaign in 2017 and 2018. Other sponsors of the MassBike’s 2018 Light Brigade include Digital Lumens, Cycle Massachusetts and Charles River Wheelers. 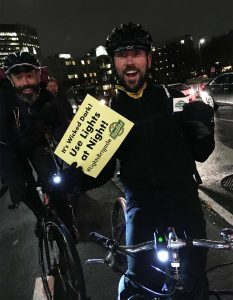 Photos: Courtesy of MassBike Light Brigade 2018 Facebook Photo Album. With more than 100 years combined experience, Breakstone, White & Gluck is a Boston law firm specializing in personal injury and medical malpractice cases. Our partners founded our firm in 1992 and we have supported bicycle safety the entire way. 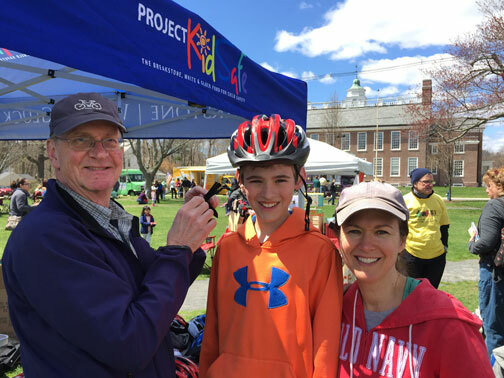 For more than 20 years, we have sponsored bicycle clubs and organizations in the Boston area (and in some cases, ridden along the way; one of our partners is also a cyclist). In 2013, our attorneys launched our Project KidSafe campaign, which has now given away more than 20,000 bicycle helmets across Massachusetts. Along the way, we have proudly worked with over 40 community organizations, including Massachusetts Safe Routes to School, more than a dozen police departments and bicycle committees in Milton, Westborough and Framingham. In 2017, we were recognized as a Silver Level Bicycle Friendly Business by the American League of Bicyclists. Cyclists: Are You Lighting Up the Road? Fireworks are lighting up spectacular skies this week. All the color makes us think about bike lights. If you are a cyclist, are you lighting up the road this summer? Are you using bike lights and wearing bright colors to stay visible to drivers? Whether you are commuting to work or enjoying a leisurely ride on vacation, bike lights are essential to preventing bicycle accidents. And many cyclists don’t realize this, but bike lights are required by law in Massachusetts. We encourage you to buy yourself bike lights as soon as possible. If you already have lights, please check to make sure they are working properly. Bicycle accidents have risen in the U.S., reaching a 25-year high in 2016, according to the Insurance Institute for Highway Safety. The majority of accidents happened between 6 and 9 p.m. The second peak time was 9 p.m. to midnight. Under Massachusetts law, cyclists are required to use bike lights if they ride after dark. The law is M.G.L c.85 § 11B. Bicycles must be equipped with a white light facing forward and a red light facing backward. These lights must be in use from thirty minutes after sunset until thirty minutes before sunrise. The white light must be visible from at least five hundred feet away. The red light on the back must be visible for at least six hundred feet. Reflectors on both pedals facing front and back are also required. If a cyclist has no reflectors, they can wear reflective material around their ankles. If you have your own bike, buy your own lights now. You can buy them online or at a local store for a few dollars. For everyone else, if there is a chance you may ride, purchase some small bike lights. They pack neatly in your work bag or travel luggage. There are many different types of lights available. When you purchase lights, take note of the size, battery type and battery life and if they are designed for day or night use. Remember that lights are required for the front and back of your bike. Attaching lights to your helmet or other parts of your bike are helpful for safety, but are considered extra under the law. Here is an article about bike lights to help you get started. There is good news for Boston commuters. There are built-in lights on the rental Blue Bikes in Boston, Cambridge, Somerville and Brookline. Don’t stop at bike lights. Purchase a neon reflective safety vest, tape and any other clothing to help drivers see you. Amazon is full of ideas. Before you ride at night, plan your route. Choose areas which are well lit and have clearly marked bike lanes. Travel the route during the day before you go at night. Monitor social media accounts for local police departments and bike committees which serve the area. Sign up for the newsletters offered by bike committees. Cyclists write these newsletters specifically for other cyclists and their experience is invaluable, especially when riding and making decisions at night. 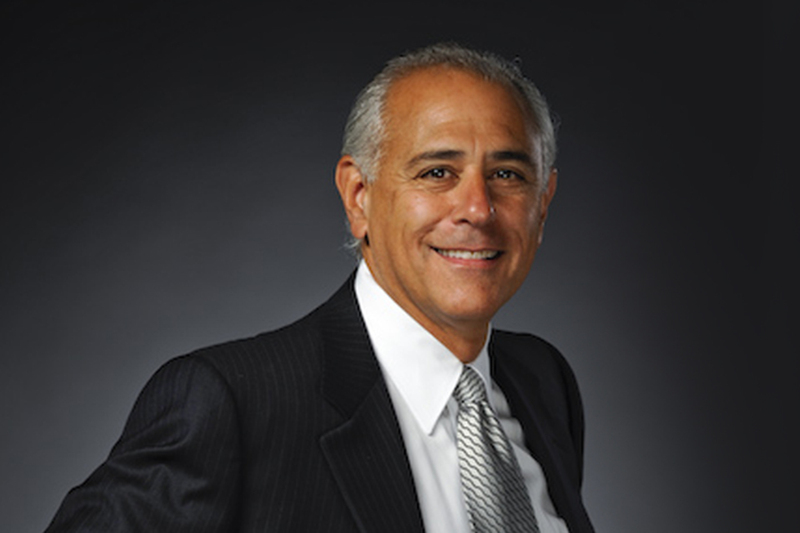 Attorney Ronald E. Gluck was interviewed by Boston Magazine about the truck crash that killed his client, the late Dr. Anita Kurmann. Gluck said he had to wait 20 months after the truck’s collision with the cyclist to obtain the video surveillance from the Boston Police Department. While the Boston Police Department found the truck driver was not responsible, Gluck said his investigation found the truck driver caused his client’s death. Gluck negotiated a financial settlement with the truck driver and his insurance company on behalf of Kurmann’s estate in June 2017. Attorney Ronald E. Gluck is speaking about the video footage of the 2015 truck crash that killed his client, Dr. Anita Kurmann. 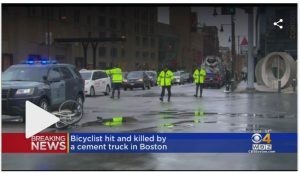 Twenty months after the fatality occurred, the Boston Police Department completed its investigation and concluded that the truck driver was not responsible for the cyclist’s death. The video footage, which came from a traffic camera at the intersection where the tragedy occurred, was in the hands of the police the day the incident occurred. Yet, the Kurmann family and their attorney had to wait twenty months to see the video and to obtain any witness information from the police department, Gluck said. Multiple subpoenas sent to the police were met with a refusal to produce the information until the police concluded it investigation. Wearing a bicycle helmet is the most effective way to prevent a serious head injury on a bicycle. It is most important for young children who are still in development and building their strength. Kiwanis Club of Somerville. 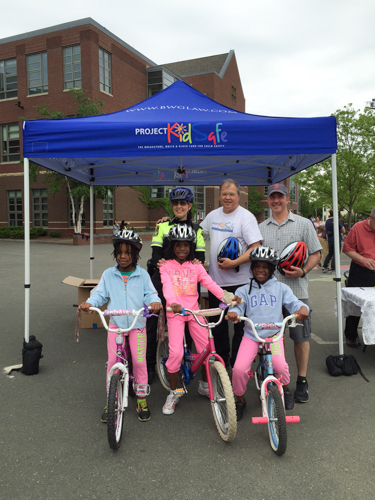 For the third year, we partnered with the Kiwanis Club of Somerville at Bike Safety Day on May 16th. Each year, the Kiwanis holds the event in a different neighborhood; this year’s event was held at the Dr. Albert F. Argenziano School at Lincoln Park. There was a great turnout and the Kiwanis and Attorney David W. White donated nearly 120 bicycle helmets. Children were also offered free bike inspections, reflectors, safety information and the chance to test out their skills on bicycle obstacle courses. Read more about the Kiwanis Club of Somerville. 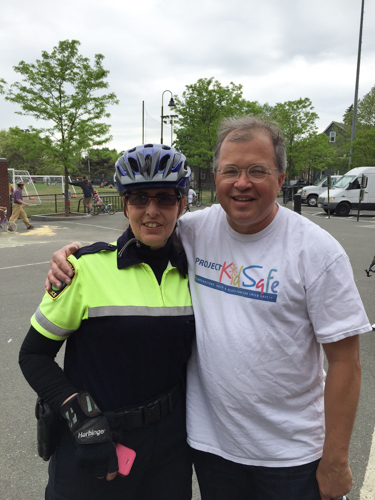 Photo: Bike Safety Day in Somerville, Massachusetts. 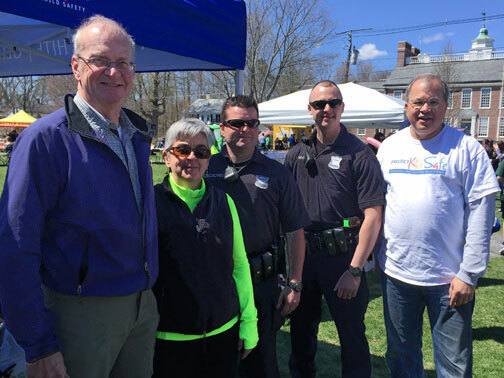 Somerville Community Police Officer Marianne Manfra, Attorney David White of Breakstone, White & Gluck and Dave Blumsack of the Kiwanis Club of Somerville, along with children who participated in the event. Photo: Bike Safety Day in Somerville, Massachusetts. Somerville Community Police Officer Marianne Manfra and Attorney David White of Breakstone, White & Gluck. Worcester Earn-a-Bike. This community bicycle shop teaches local residents the basics of bicycle maintenance while letting them work to earn a free bicycle. If you are under 17 years old, you must volunteer for 5 hours to receive a free bicycle and anyone over age 17 must volunteer for 10 hours. Worcester Earn-a-Bike is also known for its popular annual Kids Bike Sale. This year’s event will be held on June 6th. This is a fun event because every child’s bicycle is on sale for just $5. Breakstone, White & Gluck participates by donating free bicycle helmets to children who need one. This is the second year we have partnered up with Worcester Earn-a-Bike. Read more about Worcester Earn-a-Bike. Friends of Lexington Bikeways. 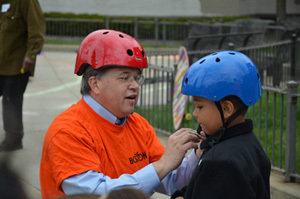 The Friends of Lexington Bikeways donated bicycle helmets from Project KidSafe to children at Discovery Day on May 23. The group showed children how to properly fit the helmets and spoke about safety with parents and children. This is the second year we have partnered up with the Friends of the Lexington Bikeways, which is active in promoting and supporting safe cycling and development of bike routes. Read more about the Friends of Lexington Bikeways. Photo: A volunteer helps a child adjust a bicycle helmet at Discovery Day in Lexington, Massachusetts. Photo left to right: Bill Hanson, chair of the Framingham Bicycle and Pedestrian Advisory Committee, volunteer Maura Kelly, Framingham police officers and Attorney David W. White of Breakstone, White & Gluck. 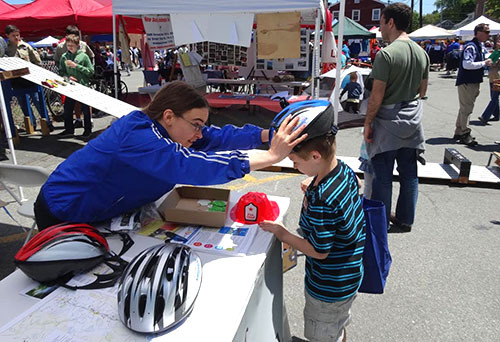 Breakstone, White & Gluck, the Framingham Bicycle and Pedestrian Advisory Committee, and the Framingham Police Department teamed up and gave away 120 bicycle helmets to children last weekend at the 5th Annual Framingham Earth Day Festival. Breakstone, White & Gluck donated the helmets through our Project KidSafe initiative and attorney David W. White participated in the event, along with advisory committee members, including Bill Hanson, chair of the advisory committee, member Joseph Repoli, volunteer Maura Kelly and Framingham police officers. Framingham Earth Day is held on the Framingham Centre Common and each year the event grows. It began in 2011 with 55 vendors encouraging residents to make eco-friendly choices. This year, nearly 100 vendors turned out. Breakstone, White & Gluck first participated in the festival last year. Through our Project KidSafe initiative, Breakstone, White & Gluck has donated over 3,500 bicycle helmets to children in the Boston and Worcester areas. We expect to have donated more than 6,000 bicycle helmets by year’s end. Our goal is to encourage children to wear a bicycle helmet every time they ride. Cyclists of all ages should wear bicycle helmets to protect themselves from a serious head injury. But bicycle helmets are especially important for children, and they are required to wear them by law in Massachusetts. Children suffer more than half of all bicycle-related injuries and deaths which require emergency department care each year, according to the Centers for Disease Control and Prevention (CDC). Some 26,000 of these bicycle-related injuries to children and teenagers are traumatic brain injuries treated in emergency rooms. Watch this video on how to properly fit a bicycle helmet or visit our bike safety web page. Attorney David W. White of Breakstone, White & Gluck will speak this weekend about how cyclists can purchase accident coverage to protect themselves from injuries and lost wages. White will speak at the Boston Cycling and Health Expo at 12:30 p.m. Saturday at the Westin Boston Waterfront. His talk is free and open to the public. 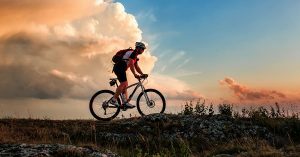 Cyclists often ride around with small amounts of coverage because they are unaware of how easy and relatively affordable it is to purchase extra coverage through their Massachusetts auto insurance policies. Drivers in Massachusetts are required to carry auto insurance, but they often carry very little and in some cases, none at all. If a cyclist is hit by a driver with inadequate insurance, he or she may be left without the compensation that is needed to fully recover and pay for medical expenses, bills, and the physical injuries. Bay State Bike Week is a good time to remember safety for Massachusetts bicyclists, motorists and all who travel the roads. Motorists can commit to being vigilant in looking out for bicyclists this summer and slowing down. Bicyclists can ask whether they have taken all possible safety precautions. These safety precautions must include bicycle helmets. Bicycle helmets are 85- to 88-percent effective in mitigating head and brain injuries in bike crashes, according to the National Highway Traffic and Safety Administration (NHTSA). Nearly 70 percent of all fatal bike crashes involve head injuries, according to NHTSA figures. But only about 20 to 25 percent of all bicyclists wear helmets. Individual states govern whether bicyclists must wear helmets. California was the first state to pass a bicycle helmet law in 1986. Twenty five years later, 21 other states have adopted laws aimed at cyclists under age 16. Fourteen states have no helmet laws, though the NHTSA recommends states adopt legislation. Massachusetts requires helmets be worn by those 16 and younger while operating a bicycle or traveling on one as a passenger. Helmets must be approved by the Consumer Product Safety Commission. Adults in Massachusetts and other states should not wait for the law to require them to wear helmets. In 2006, 773 bicyclists were killed and another 44,000 were injured in traffic crashes across the country. Children 14 and younger accounted for 98 of those fatalities, making this one of the most frequent causes of injury related death for young children. But the other 675 bicyclists were older and many of them could have also benefited from the protection of a bicycle helmet. Click here for more information about bicycle helmet laws from the National Highway Traffic Safety Administration. Tagged: "bike crashes", "Boston bicycle accident lawyer", "brain injuries", "head injuries" and "Massachusetts bicyclists"